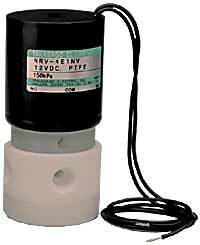 The Ventiduct is an optional part fitted between the valve body and solenoid. It has ducts for ventilation and heat radiation. Ventiduct isolates and protects the metal solenoid parts from contact with volatile corrosive gases such as Trifluoro Acetic Acid that manages to pass through a standard Teflon isolation diaphragm. The Ventiduct protects the fluid media from heat generated by the solenoid. Conversely, Ventiduct shields the valve solenoid when the fluid media is at a high temperature.